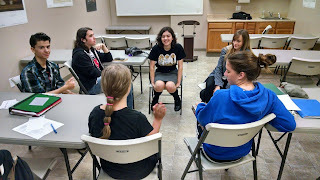 The Homeschool Gossip: Teen Booktalk in Huntersville this Monday ~ Check it out! Teen Booktalk in Huntersville this Monday ~ Check it out! Join us for our Teen Booktalk on Monday The Homeschool Room Huntersville! If you love reading and want to share that with others, then join the Teen Booktalk Club at The Homeschool Room in Huntersville every 2nd Monday of the month from 3:30-4:30PM. What is a booktalk? A booktalk is NOT a review or a book "report." A book report tells somebody you read the book, a booktalk tries to convince the person to read the book. Did you just get a book from our store that you love? Then you just have to come tell others about it at Teen Booktalk! At our facebook group we have tips on how to rock a booktalk and a Booktalk Builder template to help you prepare!